ThingLink is pleased to announce the availability of mailing list sign-ups from inside digital images. Now fans can sign up for your MailChimp mailing list when you place the new ThingLink/MailChimp Subscription Tag inside published images. This feature removes seams, bringing companies and individuals closer to their followers. Published images with the ThingLink/MailChimp tag can boost subscription rates, expanding the reach of email campaigns and continuing conversations beyond the website. Here is a 10-step tutorial on how to sign up for ThingLink and MailChimp in order to start creating and using your own ThingLink/MailChimp SubscriptionTag. 1. Sign up for ThingLink’s image tagging service. We’ll come back to this. 2. Sign up for the free email newsletter service MailChimp. 4. Click on “For your website” and then on “Signup Form Link Code”. You should now see a URL link that looks something like this: http://eepurl.com/gut75. This is the code that you will use to create the in-image email subscription tag. 5. Head back to ThingLink’s site where you have the option of enabling all the images on your site or blog with ThingLink or single tagging one image at a time. 6. In this case we choose to single tag an image and click “Import with Image URL”. Copy and paste any image you would like to tag into the image URL field. This will bring up the tag editor. 7. 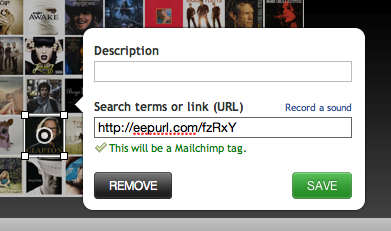 Copy the URL link on MailChimp’s page and paste it into ThingLink’s editor’s link field. 8. The editor will say that this will become a MailChimp tag. Save the tag and click Done in the top right corner of the editor. 10. Watch the subscriptions roll in. Remember that ThingLink also offers many more Rich Media Tags such as YouTube, Flickr, Soundcloud and Wikipedia. MailChimp supports more than 1 million subscribers worldwide, sending 2 billion emails per month. MailChimp is designed for the do-it-yourself power user — someone looking for all of the power of the enterprise application, but built for anyone to use.